Home / News / RAILA ODINGA postpones his US trip at the last minute - Was he going to meet with TRUMP after UHURU met him 2 weeks ago in DC? RAILA ODINGA postpones his US trip at the last minute - Was he going to meet with TRUMP after UHURU met him 2 weeks ago in DC? Thursday September 13, 2018 - NASA leader, Raila Odinga, has postponed his visit to the United States due to the extreme weather conditions expected in North Carolina. The announcement was made yesterday following advice from Duke University in Durham, which was to host him from September 16th to 19th. “The university is therefore on concerted effort to weather the storm," Raila’s Spokesman, Dennis Onyango, said in a statement on Wednesday. Onyango noted that the university told them the forecast shows Durham will remain under extremely dangerous weather conditions from Thursday to Sunday. 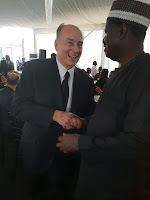 Raila was scheduled to give lectures at Duke University in the US beginning tomorrow barely two weeks after the meeting between President Uhuru Kenyatta and US President Donald Trump in Washington DC.